24, of Mexico, Maine; assigned to 1st Squadron, 61st Cavalry Regiment, 4th Brigade Combat Team, 101st Airborne Division (Air Assault), Fort Campbell, Ky.; died Nov. 29 in Pachir Wa Agam district, Nangarhar province, Afghanistan, of wounds sustained when an insurgent attacked his unit with small-arms fire. Also killed were Sgt. 1st Class Barry E. Jarvis, Staff Sgt. Curtis A. Oakes, Spc. Matthew W. Ramsey, Pfc. Jacob A. Gassen and Pfc. Austin G. Staggs. To honor PFC Buddy W. McLain, his father, Larry McLain retrieved this stone from Evan’s Notch in the White Mountain National Forest in South Oxford, Maine. Watch this video to learn why this stone is significant and what it says about PFC Buddy W. McLain. To honor PFC Buddy W. McLain, his wife, Chelsea McLain retrieved this stone from Howard Pond in Hanover, Maine where PFC McLain went fishing. I had the honor and privilege of carrying your son’s Stone on the inaugural TSP hike this past weekend. It was a pleasure to meet you, Buddy’s brother, his uncle, and the rest of the family. You have talked about how proud of a man Buddy was. Your family has also displayed the same pride. You were there to meet and talk with us at every point. I was incredibly touched that you came to see us step off for our hike, and was happily surprised that you were still there when we came down. That meant a lot to me and to the others as well. As I hiked and looked around and enjoyed the views, I thought about you taking your sons on fishing and camping trips. How much fun that must have been. Buddy obviously appreciated the time spent with you and his brothers. I was so moved by Buddy’s call to service after September 11th, because of how it affected you and the rest of his family. So many have left it upon so few to keep us safe. I cannot begin to imagine the weight you carry with you, but want to thank you for allowing me to shoulder just a small amount of weight for a short time. I plan to spend some time hiking around the White Mtns, specifically Evan’s Notch. I would love to know some of your fishing spots so I can continue my connection with Buddy and your family. Take care and I look forward to spending some more time with you and your family on Cadillac Mtn. Army Pfc Buddy W. McLain was a great man and I will make sure he is not forgotten. Where to start? I’ve been pondering this for awhile now. The entire Summit project’s Memorial Day weekend 2014 was incredible. When I first heard about the summit project I was like, “yeah that sounds great, I want to be a part of it.” I’ll hike to the summit with a stone honoring a fallen soldier. Little did I know how much I would learn about Army PFC Buddy W. McLain. He was born August 3, 1986 and died November 29, 2010; Or realize how much we had in common. It is possible that we may have crossed paths before he was deployed to Afghanistan. I learned about his family especially his dad Larry. Larry is a great father who “always made time for us” as said by Buddy on the phone from Afghanistan. I love the BB gun story. If you haven’t heard it, you should. I also met Buddy’s family including his uncle, his brother Dustin & his family. It was great to meet the family that Buddy loved and hiked and camped and fished with. Larry gave me a picture of Buddy with his son Owen and I took that with the Honor stone to the summit. I felt that Buddy was there with me, watching over me and his son. I laid his picture with the rock at the summit for a minute and took a few pictures. Buddy would have loved this place. I’m sure he would be hiking with Owen now if he could. Owen will always have an angel watching over him, wherever he roams. It has taken me a few days to take in the experience over this past weekend. It has been wonderful to see all the pictures that people have shared and read what others took away from this special day. I feel so honored to have been part of such a wonderful experience and to be able to carry PFC Buddy McClain’s stone to the summit was a very proud moment. The hike up Cadillac Mountain was such a rewarding experience I have found it hard to put into words, but I will give it my best so you and your family will know what an impact Buddy continues to make. The weather that morning as you know was less than perfect, but as my team loaded the bus we talked about how it was nice that it wasn’t too hot and the cool breeze would be refreshing. When we arrived at the start of the trail I realized quickly what a special team this was. Sooner than I thought it would, my pack began to feel heavy and my shoulders began to ache a little and I was trying to focus on not slipping on the wet rocks. While focusing on not falling, I started to think back to the video David recorded of you about the stones that were chosen and the story you told about Buddy’s BB gun and it made me smile and think about how that would be something my husband would do too! I thought a lot about my 2 girls and how much I love them and how you have taken that strong bond between father and son and have kept his memory alive being so involved with great events like that day. I thought about how Buddy signed up to serve his Country shortly after 9/11 and how it takes a special person to make that decision especially being so young. As my shoulders ached a little more I thought about how there were days while he and our other service members are overseas and they can’t slow down and they carry much more weight and continue on to complete their mission. I also looked around my team and thought about the mother, the father, the wife, the brothers of our fallen heroes that were continuing on without a complaint and how difficult not only that day must be but each day to press on. It was fitting that as we reached a point of the trail just before you get to the summit you can over look the road and when our team looked over you were driving past waving, you went to the top and were there when we arrived back to Thompsons Island. You and your families commitment to be so involved in events like this is admirable. I hope you know that I will always hold a special place in my heart for you and your family and think of Buddy and his ultimate sacrifice daily and promise I will continue to tell his story to ensure he is never forgotten. I also would like to thank you again for the keepsake and note you gave me after the hike, I will treasure it always! Take care and I hope to see you again at future events. I first heard about The Summit Project from a group of friends,and I’m so glad I was able to participate in the hike up Cadillac Mountain. Even though I grew up about 40 minutes from Mount Desert Island I had never hiked Cadillac. When I hiked it with TSP, I felt that the experience was more memorable because I was carrying the stone of a Fallen soldier- Buddy Mclain. Buddy was 24 at the time of his passing, which is the same age I am now. I thought a lot about the sacrifice he made at such a young age. I also thought a lot about his family, especially his son Owen. Buddy’s family picked out a beautiful stone, which I was honored to carry with me along the hike to the summit. Talking to Buddy’s dad Larry made me realize that he was a person I would probably get along very well with. His sense of humor and drive to become a better person are things we have would have had in common. His efforts to help people improve inspires me. I was lucky enough to meet his father in person and I feel very connected to his family as a result of TSP. His family seemed so appreciative of all that TSP is doing to honor our Fallen soldiers. I’m proud to have been a part of something as meaningful as helping these families heal. I believe Buddy and all the Fallen we honored during the hike would be very appreciative of how we have kept their memories alive. I could not think of a better way to commemorate their lives and sacrifices they made as representatives of the United States. I was given the privilege and honor to carry the memorial stone for PFC Buddy McLain on the Patriot Riders 8th annual Spring Ride for the Troops. I must say that reading his story really hit me. The senselessness of his death made me very sad and very angry. I especially loved hearing the BB gun story. I have a 14 year old son that has a BB gun and I can honestly say that I would probably make him do the same thing. That was such a great story. Thank you for sharing it. I believe that Buddy and I had a similar outlook on life, I am a proud veteran and when I see something that’s wrong, I feel compelled to make it right. I speak my mind which sometimes makes me the unpopular one. The stone that you picked was beautiful and I was honored to be able to carry a piece of Buddy with me on a ride that meant so much to me. I will forever carry Buddy’s memory in my heart. Thank you for raising an outstanding son and you should be very proud of the soldier he became. His sacrifice to me and this country will never be forgotten. Again, it was and honor and a privilege and I thank you. As my first hike ever in history, I am honored I was able to be with Buddy the entire journey. Originally, I was nervous for my first experience hiking; however, I soon realized the complete bliss of isolation in the natural world. Buddy’s love for the outdoors aided me to additionally appreciate nature and all of its beauty. As I hiked up the mountain, I was astonished by the vast space and natural beauty of the outdoors. I was able to value the luxuries offered by the young men and women who serve and fight for our country every day. Carrying the legacy stone of Buddy was remarkable. Being a part of the McLain family was a privilege that will stay with me forever. It was a pleasure to meet you and the rest of the family during the Memorial Day weekend festivities. From the first steps up the mountain to the last steps from the mountain, you were there to support my adventure with Buddy. Thank you for sharing the past memories of Buddy, which shall always be remembered. Mr. McLain, I want to say it was an honor to carry your sons stone across the city of Portland and it was a great opportunity to learn about your son and what he did and liked to do I myself like to hunt, fish, hike, and camp . I look up to my father as buddy looked up to you. Though i’m 15 I have plans to go in the military and I have been getting training for my military career from The Army Cadets this program introduced me to the summit project back in February and it was a whole new feel to be the one carrying the stone and I felt very proud to be carrying a soldiers memory . I have to say I loved the BB gun story, my lieutenant and platoon chuckle every time. Buddy is a hero to everyone he knew and everyone he protected back home. Though Buddy may not be present soldiers never die. I wish you and Buddys family the best. HOOAH! I was asked by a friend who had been assigned your son’s stone to carry it when she was called away at the last minute during the Summit Project ceremony in Lincoln Maine. I considered it a honor and privilege in doing so. I served in the US Army myself for two years. I have a lot in common with your son with his taste in cars, music, and the outdoors. I served in the artillery and went overseas to South Korea and finished my duty in Fort Lewis, Washington. I proudly support the troops. I make sure to shake the hand of every vet or active soldier I happen to come across and thank them for their service. I think everyone should. I thank you and the Summit Project for allowing me to carry your son’s stone. I will remember and cherish the memory as long as I live. To say I was nervous about this honor is an understatement. This is more than just a hike, more than a fundraiser or achieving a personal goal or even showing your patriotism for your country & state. This was one of the most fulfilling and emotional journeys I’ve ever taken. I was assigned Buddy’s stone by Dave Cote because I felt so overwhelmed after reading all of the bios of our lost Heros… How do you choose? I believe that Buddy’s stone chose ME. After reading Buddy’s bio and watching the interview with you several times, Laughing and crying and laughing some more, I googled him to find out more about his life and his service. I soon found that Buddy and I actually had a lot in common. I was really saddened to hear that you had car trouble and wasn’t able to come that day. I actually looked at the clock to see if I would have enough time to drive to Rumford and GET you and bring you to Bar Harbor. I quickly realized that that was an impossible task. The day began with a frosty but gorgeous sunrise. We began our hike in a light drizzle that soon turned to rain. As we ascended above the tree line, the rain let up and the clouds began to clear just as we arrived at the most beautiful view of the ocean. It was magical. The whole way I’m rehearsing in my head, my speech that I had prepared for the ceremony at the summit. Hoping that I would be able to share with these fellow hikers, the amazing and wonderful man that Buddy was. As we reached the summit we were met with the most beautiful rainbow. I think we all felt that it was a sign from our heros that they were right there with us. As we went around and spoke of our Fallen Heros, describing their bravery and strength, I tried to focus on Buddy’s life and his dedication to family and country. The obligation he felt to serve his country after 9/11, and what that meant to you and how proud you must be of him. I feel like I know you already and I hope to be able to meet you at the next hike and give you the hug that I had planned on giving you this year. I would love to hear more stories about Buddy and your time spent in the White Mountains, hiking and fishing. I have already shared Buddy’s story with so many of my friends and I believe that is what The Summit Project is truly about. Ensuring that our heros are never forgotten. Buddy will forever have a place in my heart. I am so sorry for your loss. Thank you for sharing Buddy’s story with us. My life is forever changed by this experience. Take care, I hope to meet you soon at future events. I had the honor of carrying Buddy’s stone on The Summit Project’s hike up Cadillac Mountain on October 17th. I have to admit, I initially started this project as a reporter. It’s just in my nature. First, I read about Buddy on The Summit Project website, watched the interview with Larry a few times, and took down notes. I was particularly struck by Larry’s genuine personality, and moved by the way he spoke so proudly of his son. I then Googled Buddy. I read articles about him. I looked at photos of his wife and son. I scrolled through as many images of Buddy as I could find. I started my hike feeling confident in my research and understanding of Buddy, but I was very nervous about the physical challenges of the day. I honestly didn’t know if I could do it. I never owned hiking boots before that day! But the spirit of the day — and my fellow hikers — encouraged me and helped me get to the summit. On our way up, I let the reporter side of me go and let the human side take over. I listened to my fellow hiker’s speak emotionally about their soldiers. I connected with them, quickly became friends, and trusted them to help me on the hike. I was not expecting this experience to be as emotional as it was. My entire team was fighting back tears as we presented our stones and talked about our heroes at the summit. I told them how Buddy was trying to make a better life for his family. How he was moved after 9/11 to join the military, to prevent another terrorist attack from happening. How every time his father talked to him, he sounded more like a “man.” How important it was for Buddy to call home from Afghanistan to thank his dad for being such a great father to him. I told my team Buddy taught me how important it is to tell people you love them and how much they mean to you. To really mean it. And really vocalize it. I really felt Buddy’s spirit that day. Having his stone and his story pushed me to new physical and emotional limits. I can’t thank the TSP for giving me the opportunity to be a part of a wonderful team, and take a step away from my reporter-side, and really give back to military families in a way that is meaningful to them. MAINE HEROES ARE NEVER FORGOTTEN! I had the honor of being in the police detail that escorted Buddy home from when he was brought back to the States and landed in Portland. To see the number of people that gathered to show their respect and honor for a fallen hero was moving. I briefly met his family at the Portland Airport and I could see the pain and sorrow as well as the pride they carried with them. As we in the detail escorted him on his final journey home it brought a sense of pride, sorrow and anger at what we were doing. Proud to do it, sad we had to and angry that it had to happen. We will never forget Buddy or the sacrifice he made. My name is Mike Winslow and I had the honor of carrying your son, Army Pfc. Buddy McClain’s stone up Cadillac Mt. on October, 16, 2015. I’m not sure if you remember me, I’m the Baxter State Park Ranger that was seeing the teams off, as you also were, on the Memorial Day TSP hike in the park. At that time I was very new to TSP. My interest of learning more about the stories behind these stones was growing. The night before the hike I had the honor of speaking to everyone at Twin Pines during the hiker brief. That was my first true understanding of TSP. I will never forget the emotions that hit me to see all the stones in one place. I went home that night knowing I wanted to get more involved in honoring our states Heros. Spending the next morning with you in the Katahdin Stream parking lot brought the emotions full circle for me. To see what it meant to you to know that Buddy will never be forgotten is a feeling I will never forget. Fast forward to October, 2015. As a team leader for TSP at ANP I was getting ready for a practice hike on the Blackwood’s trail. There were four of us hiking that day. My Fiancée was the one to organize and pick up which stones we hiked that day. In our talks about TSP I must have mentioned my time with you that morning at Katahdin Stream campground, because she arraigned for me to hike with Buddy’s stone. Mr. McLain, you obviously made your sons a priority and took pride in raising strong and proud young men, and I believe you did just that. This country is full of sheep and on September 11th Buddy made the decision to be the Sheep Dog. I have a huge amount of respect for Buddy for stepping to the plate for his country. Buddy’s story will stick with me forever and I look forward to sharing his story with others. When the day comes I get my little fella his first BB gun, I’m sure we’ll have a talk about Buddy. When I first became involved with TSP my intent was to hike a stone at the TSP at ANP 2014 event. During the selection process Buddy’s story really struck a chord with me, having similar childhoods of sportsman activities with my Dad, and his stone was one of my selections. As fate would have it I did not hike that event. I had the pleasure of sitting and chatting with you at dinner at the 2015 TSP at BSP. I appreciate your candidness during that conversation answering some hard questions I posed regarding TSP and it’s impact on your healing process. This strengthened my desire to learn more about Buddy and to hike with his stone. I had it in my backpack at the Aug 2015 Run for the Fallen, but fate had other plans and I gladly gave up the stone to someone who knew Buddy and wanted to carry it. A few weeks ago I had the honor of finally carrying Buddy’s stone and story. We hiked up Hawk Mountain in Waterford and sat on the ledge for a good hour in the fresh brisk early winter air admiring the local views of Bear and Little Moose Ponds (both great fishing locations) and distant views to the northwest of the Presidential range and the White Mtn Nat’l Forest. I wondered if Buddy had ever been here, and hoped I had made a good choice given his passion for fishing and Evan’s Notch recreation. The hike and the quiet time on the ledge allowed me to reflect on all I had read and heard about Buddy, at times wishing I had been more like him when I was his age. I was impressed by so many things. His resolve and commitment in joining the Army to try to help prevent anyone from ever having to suffer the emotional impact he saw his own family go through after 9/11. The call home from Afghanistan to thank you for the upbringing you had given your boys after he had a chance to compare it with that of his comrades. As you mentioned in the video on the TSP site, that day let you know your boy was now a man. He had gotten past that wall of pride that seems to block many of us from showing our true emotions. Also the fact he appreciated that you always made time for your boys. From the quote in his yearbook that all he wanted was to make his parents proud, it sounds like early on he set a goal and he achieved it in spades. Your pride in your son is evident and more than well founded. On the hike back to the car we took a detour and followed a game path off a logging road in hopes of seeing some wildlife. We saw signs of moose antler scratches on a tree and the remainders of some small game that fell victim to possibly a fox. But alas, no game sightings. It was another nice quiet time to reflect on all I had learned about Buddy, the youngster who learned a tough lesson about being held responsible for your actions via a BB gun incident, to the young man who sacrificed his life serving his country and protecting the freedoms we all enjoy daily. While Buddy’s stone has returned to the shelf at MEPS his story will be with me for life. I hope we meet again at an event. I’d love to hear more about Buddy so I have a more complete picture of who he was, and how best to live my life to show the honor and respect he and his family deserve for their sacrifices. When I heard about The Summit Project coming to Newport I knew it was something that I wanted to participate in. My Father was a proud Korean War veteran and if he was here today he would have carried a stone OR maybe we would have carried it together. I was able to walk with a friend who I had lost touch with 16 years ago, she carried a stone and we were reunited because of this project. The walk was amazing, the honors at the memorial were beautiful AND oh my when we went inside to talk about the soldier’s stone that we carried — lots of tears. I am so thankful that I was able to be a part of such an amazing project — MHANF! This morning I finished my shadow box — Army PFC Buddy W. McLain will forever hold a place in my heart and in my home. and am honored and humbled to run this Memorial Day in honor of Buddy McClain who selflessly gave his life for our country . I had the opportunity to carry Buddy’s stone this Memorial Day weekend at Baxter state park. Along with Buddy’s stone I carried the stone of a friend and comrade of mine. It was a young warrior riding alongside an old warrior to the top of a peak where they could be recognized for their service and sacrifice. Two men who loved the outdoors hopefully sharing stories of their favorite places to go. The weight I carried both physically and mentally strengthened me and helped me reach my objective, the summit. I learned a lot about Buddy before the hike but nothing compared to what I learned from his father Larry. I had the opportunity to roommate with him for the weekend, an amazing experience. We talked at length about Buddy and his service as well as his childhood. I was able to draw a parallel between Buddy and my oldest son which made me feel like I understood him. It truly was an honor to become acquainted with Buddy and his family, I feel like I gained an extended family. Thank you Andy. Like I said you are a McLain famIly member. We hope to see u again soon. Sending you hugs, Larry and Terry. 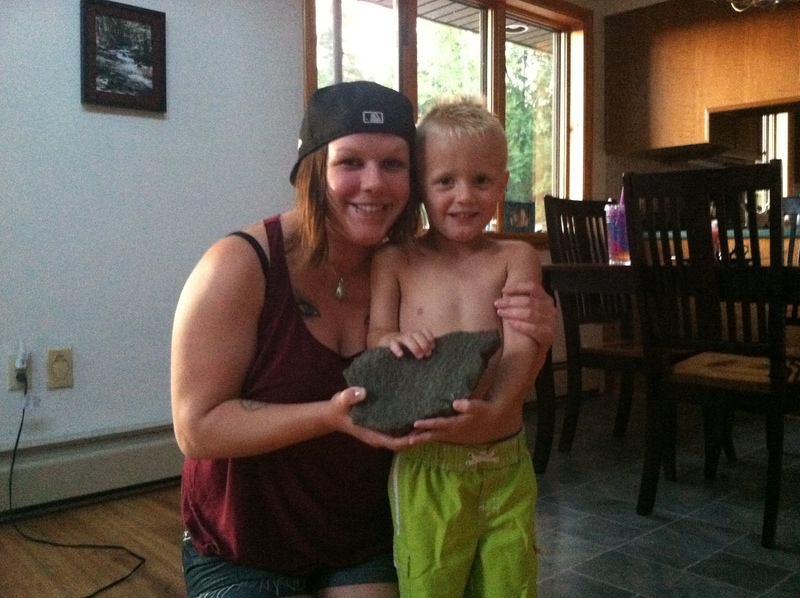 “We enjoyed carrying Buddy’s stone up the mountain. It was a tough hike but it was worth carrying his stone and learning about him. He was an accomplished person and would’ve enjoyed the hike. Carrying Buddy’s stone will be a memory that we will never forget. No man left behind. Our fallen brothers, sisters, sons and daughters all lived by this motto while they were defending our flag. Having a few extra pounds in my pack was nothing compared to the sacrifice that individuals like Buddy McClain made. As soon as I knew Buddy stone was unassigned I knew it was my duty to put his stone in my pack to make the trek up Dorr and Cadillac. I apologize to Buddy’s family, I have not had the time to learn about Buddy himself. What I do know about Buddy is that his family is an amazing family. For the past three years, each Memorial Day weekend, it has been an honor to see the presence of Larry and Terry. Each year during the annual Memorial Day hike they have sacrificed their time to great TSP hikers the morning of the hike and upon the hikers return. Larry presence at the start of the trail has become such a warming and welcoming sight each hike. And even more welcoming upon the return trip down the mountain after a difficult hike with a hand shake and a thank you straight from the heart. With all my heart and admiration I thank you Larry and Terry, but also I thank Buddy for his sacrifice and commitment to his fellow soldiers and his family and country. Your commitment and sacrifice will never be forgotten. My name is Karen Staples and I carried PFC Buddy McLain’s stone and story up Cadillac Mountain on October 1, 2016. This hike was more emotional than anticipated bringing back memories of many fallen soldiers that had touched my life in one way or another. I was there that day to honor one specific soldier, but carried many in my heart up that mountain. I first learned about Buddy in 2010 after he was killed in action in Afghanistan and met his family for the first time. Buddy left behind a young wife and son, along with his parents. He put others first at home and in combat . 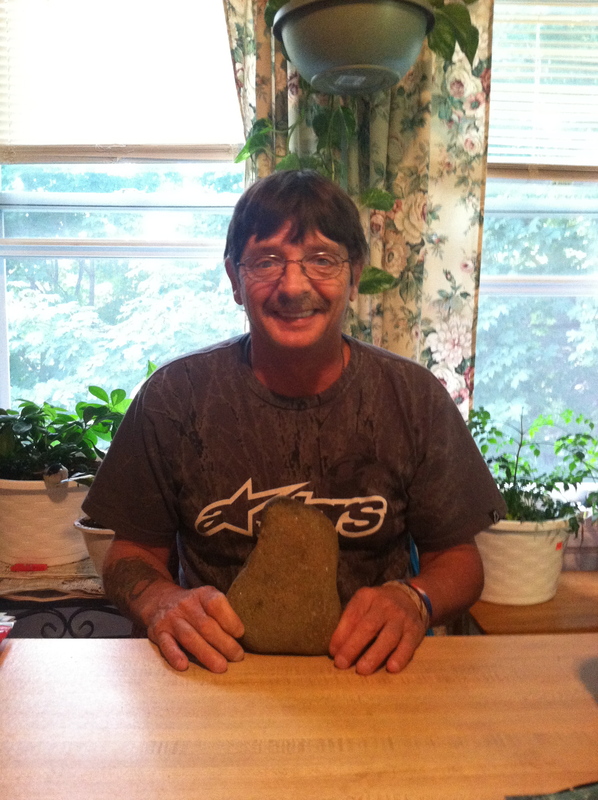 His father Larry McLain retrieved the stone I carried from Evan’s Notch in South Paris. As we climbed Cadillac and shared the experience and memory with other Gold Star Families I realized just how many similarities Buddy’s life had to mine and it made me want to spend as much time as possible with my family because you never know what God has in store for us. I had the pleasure of seeing Larry again and appreciated that he was at every piece of the event showing his support. Larry told me a story of when Buddy was younger about catching a fly and putting it up to his ear to try and hear what noises a fly made when it flew into his ear. After returning the stone to Larry that day a fly flew by my ear bringing a smile to my face letting me know that Buddy was watching and appreciated being remembered that day. It was an honor hiking with Team Kebo up the North side of the mountain . This is a great project that continuously gives back to Gold Star Families and has created a great community so that none of our fallen heroes are forgotten. I look forward to future events and bringing my children for them to learn about these men and women. I was honored to have the opportunity in my English class to take part in The Summit Project and learn about a soldier. It was my privilege that I was able to carry Buddy’s rock to the top of Streaked Mountain with me and explain to my classmates what I learned about him. Reading about Buddy’s life and experiences made me clearly understand that he was a patriotic man that risked his life for his country’s freedom and to keep people like myself safe. I’m very grateful to have had the chance to learn about Buddy and who he was as a person. Buddy came from a rural town in Maine called Mexico where he raised his son. Buddy seemed like a very good father as he spent a good deal of time with his son. Buddy and his son would go fishing at a pond by their house in Maine. Chelsea McCain, Buddy’s wife chose to represent her husband, Buddy, by picking his rock in a place where him and his son went fishing together and to me that is very special because it shows what kind of a person Buddy was. Being given the chance to carry Buddy’s rock up Streaked Mountain was such a special experience. Hiking up a mountain while carrying a heavy rock didn’t sound very pleasant to me at first. However, it can’t compare to what Buddy did for his country while fighting in Afghanistan. It takes a lot of strength to do what he did, especially where he enlisted shortly after 9/11. I’ve never lost somebody close to me in a war tragedy. However, my heart is heavy for your family. I can’t imagine how awful it must’ve been for you to hear about his death. Buddy’s service is greatly appreciated and I can’t thank him enough for what he did. Learning about Buddy made me realize that life is too short and you should spend more time with family. Being introduced to Buddy’s story and his life was a memorable experience for me.I’ve never lost somebody close to me in a war tragedy. However, my heart is heavy for your family. I can’t imagine how awful it must’ve been for you to hear about his death. If Buddy was here today, I would thank him for his braveness in joining the Army. He provided citizens, including myself, with reassurance that my country is safe. Enlisting in the Army was probably a very difficult decision, especially considering it was right after 9/11. I want to say thank you to Buddy’s family for sharing his experience so that I was able to be a part of such a remarkable project. Buddy will never be forgotten and neither will this experience. On October 20th, I had the honor of carrying up your son’s stone to honor him and everything he did for us. This was called the Summit Project. I carried the stone up the mountain, and got to read a short note card giving my class mates a little background on Buddy. I was very aware that the soldiers of our country are the bravest men on earth, but hearing about the deaths of the other fellow soldiers, it made me realize that these guys really will do anything. Buddy sacrificed everything he had so kids like me could live an everyday, safe life, and I can’t thank him enough for that. I liked Buddy’s stone a lot. The stone came from the fishing spot Buddy and his son would fish at. I think this is a great symbol of who he was as a family man. Buddy did what he believed was right and what he thought he needed to do. I wish I could shake Buddy’s hand and thank him for everything he did: the sleepless nights, the sounds of battle, all the grit and grime he went through. I’m sure the man upstairs is taking really good care of Buddy. I thank Buddy for all he did, and I hope the little back ground I gave to my class mates will stay in their minds, because Buddy will always be in mine. Together with a group of Boy Scouts from Saco, I had the honor and privilege of carrying Buddy’s stone on January 7, 2017 at the Portland International Jetport. Buddy’s desire to protect our great country and his actions to make his parents proud are inspiring. I found it very emotional talking about Buddy’s story due to his wonderful connection with his father Larry. Buddy reaching out to his dad while on duty to tell him what a great parent he was and that he appreciated him always making time for him made me think of my own children and how I am doing as a parent. This past weekend I was with my daughter in Evans Notch and I thought to myself Buddy would be pleased. I am thankful that Buddy served our country to protect us and our freedoms. This Memorial Day event was my 2nd time to carry Buddy’s stone in an event. It was also the first time that The Summit Project put a team in place to climb Mt. Katahdin as part of the TSP at BSP2017. So this event was a special one for me. A special highlight included the opportunity to meet Buddy’s brother and nephew, Dustin and Abel at base camp this year. When I remember Buddy, I find a connection that he is another small town kid, like me. I remember that he grew up in the outdoors – hiking, camping, fishing, hunting, and ripping around on motorcycles like many of us did. But as he was growing up, he also learned about loyalty and service. I’ll also remember my conversation with Dustin and learning that Buddy was extremely loyal to his family and friends. I found a sense of humility when I remember that Buddy enlisted after 9-11 to help ‘do something’, and to make a good life for Chelsey and Owen. One of the things I always notice when I do research on Buddy is that in nearly every photo is that he was smiling a big, genuine smile that suggests that he loved his life. On the mountain, when I got tired, I reminded myself of Buddy’s smile. I tried to remain upbeat and happy, joking along with my teammates about the conditions (or whatever funny thought came into our heads). I also tried to be an informal leader of the team pack that was hiking together at different points on the trail. Going forward, I will continue to share Buddy’s story with other leaders and friends. While this cannot bring Buddy back, I hope that it helps to pay his sacrifice forward so that his legacy can continue making an impact on future young leaders of our towns, state and nation. And when I listen to AC/DC, I’ll smile as I imagine that Buddy is sitting beside me wearing his big smile. Semper memento Buddy – We’ll keep leading from the front for you. Thank you Russ. Love Larry and Terry. “I felt honored to be able to carry Buddy’s rock up to the top of Table Rock. The hike started out fairly easy but got much more difficult. Every time the trail got harder or I wanted to give up, I thought of what Buddy may have gone through when he was overseas, that thought alone pushed me forward to the top. This experience has been amazing and I feel honored to be able to participate”. “It was an honor to carry Buddy up to Table Rock. I was the one to carry him down. With this program, I have participated twice before. This time we went up a newer and harder trail, but I was not carrying his rock, but I could still feel him pushing me along the long and difficult trail. On the way down I was carrying him and I still could feel him with me and helping me along. I want to thank you for letting us do this, it was a beautiful place which I hope Buddy could have seen”. I had the privilege of carrying Buddy’s stone on the TSP 9/11 hike from USM Portland to USM Gorham. I’ve been struggling to try to put into words what this meant to me (my apologies on it taking a bit of time). This was my first TSP hike and it’s taken a bit longer than I thought to process all the emotion from it. As I researched Buddy’s life before the hike, I realized there were a number of ways I could connect to him: a sense of honor, a willingness to communicate appreciation and emotion to the people he cared about, a strong work ethic, and perhaps most of all, a deep and abiding love for the outdoors. I felt particularly honored to carry Buddy’s stone on 9/11 of all days, knowing that it’s your birthday, Larry, and knowing how pivotal that day was to Buddy’s motivation for joining the Army. It’s a day that most of us won’t forget for a multitude of reasons, but it felt particularly right to mark the day by carrying Buddy’s stone, sharing stories about his life, and honoring the memories of so many brave fallen soldiers. I hike often, in many of the same places that Buddy spent time, and though I do not carry his stone with me constantly, please know that I am carrying him on those hikes in spirit, every time. His life–and his sacrifice–are not forgotten. I had the Honor and Privilege of carrying PFC McLain’s stone on TSP hike of Cadillac Mtn. at Acadia National Park this fall. It was a great experience to be able to connect with Buddy through the stories that were told by his family and other hikers who have carried Buddy’s stone on previous hikes. As we ascended the two peaks on our hike I tried to contemplate Buddy’s life from what I learned about him and tried to imagine what kind of man he was. The conclusion that I came too was that Buddy was Hero, a Father, a Husband, a Son, and much more. Buddy joined the Army in search of a way to provide for his new family and to show his patriotism to his country. I learned that Buddy was a very loving father and husband and was always there for his friends and family to cheer them up when they were down. I started to feel a connection to Buddy having served in Afghanistan myself I could relate to his time over sea’s, missing his family, and looking out for the guy next to him. Buddy served this country with extreme Honor and Pride, and we are all grateful for his courage. I look forward to my next hike with TSP and the next soldier I get to honor, and I will always remember Buddy and his sacrifice to this country for the rest of my life. Dear Larry and family. Larry, we first met a few years ago when I did my first hike with TSP. My daughter Clare and I were sharing a camp site at Smugglers Den and I noticed a display set up at the site next door. Clare and I made our way over to your site and had the honor of meeting you and hearing our first account of one of Maines fallen hero’s. You told us all about Buddy and the circumstances that led to his death. That was when it first hit me of how important it was for me to be participating in such a great cause. I had the honor and priveledge to carry Buddy’s stone, share his story and honor the memory of his and your sacrifice at TSP’s ANP hike a week ago. With the events surrounding Buddy’s bridge dedication and the delay, circumstances kept us from talking directly so I am grateful that I was able to have met and talked to you about Buddy at past events. It gives me great pride to know that there are still young patriots like Buddy in our country and parents like you to raise them that way. I had the honor of leading Team Tarn up Cadillac Mtn. on Sept. 29th. It was a very special weekend and hike. Buddy and all of the other heros were well represented and their stories shared to many tears and many smiles.